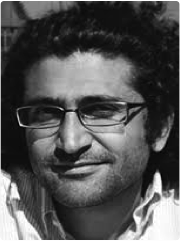 Alireza Khatami (1980, Iran) worked in the Iranian film Industry before going into exile in Malaysia where he then worked as a Visual Effects Supervisor. Currently he lives in the USA and studies Master of Fine Arts in Film Production. His debut film, Oblivion Verses, was selected for the Script Station of 62nd Berlinale Talent Campus and received the Hubert Bals Fund from the International Film Festival Rotterdam.